I remember how difficult this was last year so I'm starting much earlier this year to give myself time to work some of these out. I did keep a spreadsheet this year to remember every beer I had and hopefully this will keep me in good stead. Best Australian Draught Beer - Little Creatures IPA. On tap this beer is amazing! It gives Hop Hog a run for the title of Australia's best IPA on tap. Unfortunately it does not translate as well to the bottle so the best way to sample this one is to find a pub and enjoy. Best Australian Bottled or Canned Beer - Mornington Peninsula Russian Imperial Stout. This beer got a gold medal at the AIBA this year and it really deserved it! Such an excellent beer from one of the best breweries in Australia at the moment. 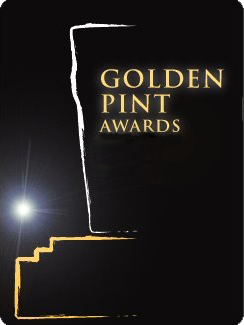 I can wait to see what my winners of the Golden Pint for Best Australian Bottled Beer produce next year! Best Cask Beer - For me this one wasn't as much about the beer as it was about the experience. Young's Special Premium Ale was the first beer I had on cask in a London pub and for that reason it can have the Golden Pint for Cask beer of the year. Australia is slowly embracing this and there are now a few pubs with hand pumps floating around, so maybe there will be an Australian winner in this category next year. Best Overseas Draught Beer - Epic Hop Zombie. One of my favourite IPA's and it's even better on tap! It's the clearest IPA I can think of off the top of my head. Check out my (terrible!) full review of it that I did last year here. Best Collaboration Beer - Holgate/Nøgne Ø Half a World Away. I was really tossing up between this beer and another Nøgne Ø collaboration, Aurora Borealis/Australis. brewed with Bridge Road. Both were really excellent beers but Half a World Away gets the nod for it's wider market appeal and it's story of the brewer swap. You can read a full review here. Best Overall Beer - Pliny The Elder. Russian River's Imperial is known as one of the best in the world and it certainly lived up to that when I tried it less than a week ago! Words can't describe just how good this beer is. Check out my full review here. Best Pumpclip or Label - This one is a no contest for me. 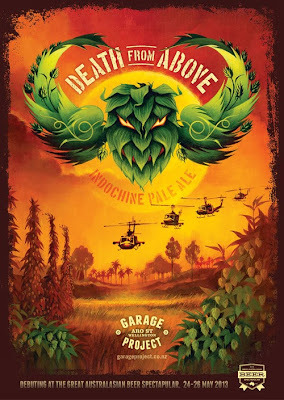 It can only be Garage Project's Death from Above. Not only was the artwork amazing but the beer was one of my favourites for the year. The combination of chilli and Vietnamese mint combined with hops was just incredible! Best Australian Brewery - Holgate. Born in 1999 Holgate Brewhouse in Woodend is one of Victoria's leading microbreweries. I've been to the brewery before and its really cool. This year they really stepped it up and impressed me, the Hopinator (with the new recipe) is one of favourite beers of the year. The special 1000th brew, Millenium Falcon was another highlight of my year and they are deserved of my Golden Pint for Australian Brewery of the year! Best Overseas Brewery - Mikkeller. Best Overseas Brewery is one of the toughest categories in the Golden Pints. I've awarded mine to Mikkeller this year. Their beers are just amazing and having their bar around the corner from our hotel in Copenhagen was awesome! Best New Brewery Opening 2013 - Temple. So technically it's not a new brewery but it is the relaunch of an old favourite. The guys at Temple went into voluntary liquidation earlier this year after a business dispute and recently managed to buy the brewery back. I went to their Resurrection Dinner at Alehouse Project, which was awesome, and I can't wait for them to start pumping out Scarlet Sour and many new brews in the future! Pub/Bar of the Year - The Gertrude Hotel. It's close to work, it's crafty, it's reasonably priced and the food is awesome! There's not alot more I could ask for in a pub. Beer Sale Friday (5-7pm) is also about my favourite time of the week, all pots $4 and pints $8 - that's cheaper than Carlton in many pubs! Best New Pub/Bar Opening 2013 - Alehouse Project. Yes technically this opened in 2012 but I never went there until this year so I'm claiming it. It's fast become one of my favourite venues, shame it's a long tram trip from home. They do a heap of events and are definitely worth checking out if you live near Brunswick, or anywhere in Melbourne for that matter! Best City for Beer in Australia - Easy - Melbourne! The best bottleshops, the best bars, the best microbreweries - what more do you want! I haven't been to Perth recently but all the other capital cities don't have anywhere near as much "beer infrastructure" if you will. Supermarket of the Year - Coles. This is going to be controversial with alot of people, but I really think Coles (and by extension Liquorland) have really stepped up their game this year. The Steamrail beers brewed by them are solid, I haven't yet had the Pilsner but the Golden Ale was the pick of the bunch I've sampled. If you are looking for a cheap option you could do worse... Special mention to Dan's for installing Growler systems in some stores. Independent Retailer of the Year - Acland Street Cellars. This was a tough one for me, but I've gone with Acland Street because they've been importing their own American beers for a while and brought some really interesting stuff never before seen in Australia out this year, including my Overall Beer of the year; Pliny the Elder! Online Retailer of the Year - The Beer Cellar. These guys have a really impressive range of International beers, with stock changing regularly. I've bought stuff off them twice and both times the delivery was really quick and nothing arrived broken. I'd highly recommend using them if you are looking for some harder to find stuff. Best Beer Book or Magazine - Beer Buyers Guide. This is another controversial selection, but I feel that we need to encourage places like Dan's supporting craft beer. This is the book that they try and flog at the registers and while not perfect has good stylistic notes and a good section of food matching. For $20 it'd make a nice little present for someone. Best Beer Blog or Website - Tasting Nitch. There's so many beer blogs that I glance across from time to time that this is an incredibly difficult Golden Pint to award. Tasting Nitch gets the nod because it's from a different point of view than most bloggers. I'd highly recommend checking it out. Best Beer App - Untappd. I somewhat sceptically signed up back in April thinking I'd never really use it. Over 1000 check-ins later and a new section on Beer O'Clock Australia devoted to Untappd, you could say that I'm hooked. It's a really good way to see what other craft beer drinkers are drinking and to chat about awesome (and not so awesome) beers. Best Online Brewery Presence - Feral. West Australia's Feral get the Golden Pint award for Best Online Brewery Presence because I can recall a number of photo's off their Facebook page. Mornington and Little Creatures are also both good on the Social Media front. Food and Beer Pairing of the Year - I almost always think the best food and beer pairing I've had is the latest one. This year there was a clear standout.The Temple Resurrection Dinner at Alehouse Project paired Temple's Resurrection Pilsner with this Roast Chicken and Scallop thing on a bed of barley with corn and horse radish and other stuff. It was amazing! So there we go, what I spectacular year of beer it's been! Once again this task to complete my Golden Pints was almost impossible! I think next year I'm going to try and take some notes throughout the year to make this not take almost a month to actually complete. I've got a wrap up of my year of beer in the works as well so hopefully that'll be up in early January.